In August 2000, Mr. Kornak applied for employment to the VA, submitting a false “Declaration for Federal Employment” form. Mr. Kornak denied that he had been convicted or on probation in the preceding 10 years, whereas in fact, he had been convicted of mail fraud in 1992 and placed on probation for 3 years. 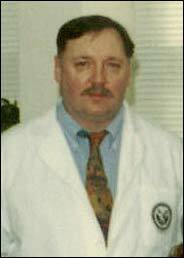 By October of 2000, Mr. Kornak was responsible for organizing, coordinating, implementing, and directing all research elements in the Stratton VA Medical Center oncology research program. Specifically, Mr. Kornak was the site coordinator at the Stratton VA Medical Center for the “Iron (Fe) and Atherosclerosis Study” (FeAST), cancer studies known as Tax 325 and Tax 327, and a bladder cancer study. The FeAST study was a clinical trial that tested a novel procedure for controlling atherosclerosis, also known as hardening of the arteries, by reducing the iron in the body through blood drawing. The Tax 325 cancer treatment study involved the administration of pharmaceutical products to patients with metastatic or locally recurrent gastric cancer previously untreated with chemotherapy for advanced disease. The Tax 327 study involved the administration of pharmaceutical products to patients with metastatic hormone refractory prostate cancer. The purpose of the bladder cancer study, which was co- sponsored by the National Cancer Institute, National Institutes of Health, was to compare the use of difluoromethylornithine (DFMO) to the use of a placebo in patients with low grade superficial bladder cancer according to time to first recurrence of the tumor and toxicities. A lifetime debarment of Mr. Kornak is necessary to protect the public interest overall. Given the scope of his criminal conviction, his longstanding pattern of criminal behavior, and his total disregard for the safety and well-being of human subjects, Mr. Kornak’s responsibility to engage in transactions with the Federal Government cannot be assured at any time in the future.